On the page you wish to edit open the ‘Page settings’ menu. Move to the ‘Time limits’ tab. In the top section that says MM:SS add the amount of time that you wish to limit your learner to, for instance 00:02 is 2 seconds. Once you’re happy, hit ‘Save page settings’. 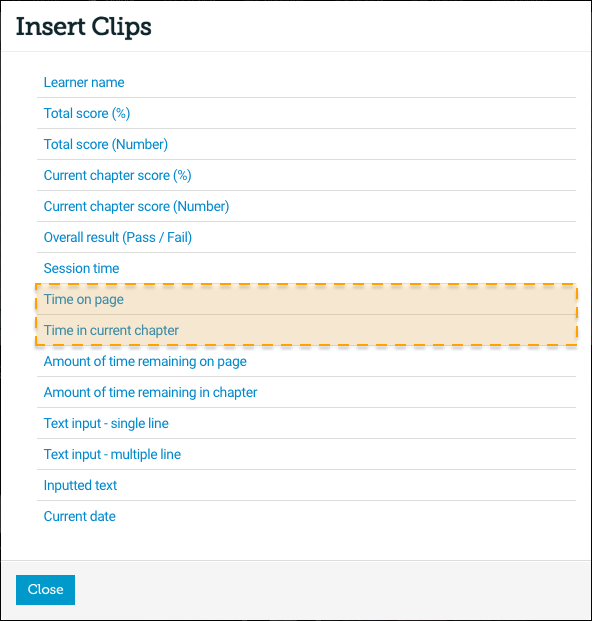 You can also set a timer for a whole chapter, for instance this would be handy if you wished to create an assessment that was limited to 1 hour. Firstly set up a section of your course as a chapter by opening the ‘Page settings’ menu and pressing the ‘Is this page the start of a new chapter?’ tickbox. In the lower section that says: ‘IF this page is the start of a new Chapter, you can set a time limit and redirect for the whole chapter here’ add the amount of time that you wish to limit your learner to and choose a page you wish to redirect them to. Once everything’s in place, press ‘Save page settings’. You can show your timers in a page by using ‘Clips’. Time on page - This will show how long you have left on the page you are (if you have set up a timer on that page). Time in current chapter - This will show how long you have left in the chapter (if you have set up a timer on that chapter). Timers are not restricted to assessments, you could also use timers to create an animated series of pages and audio, or maybe something we’ve not even thought of yet!